A house near the intersection of Northwest Hannan and Fisher roads in Buxton caught fire late Sunday afternoon, June 24, prompting a three-alarm response involving fire agencies from around the region. Banks Fire District spokesman Mitch Ward said the fire was reported at about 4:49 p.m. The house that caught fire in the 22000 block of Hannan Street is actually located behind the Banks Fire District's Buxton station, Ward said. However, that station is typically unmanned, he noted, so personnel were dispatched from the Banks main fire station and from elsewhere in the district, which covers much of rural northwestern Washington County. The two adult residents of the house were not home at the time of the fire, Ward said. They own three dogs, all of whom escaped the blaze, he added. "A passerby — evidently, a neighbor — had gotten the dogs out while (the residents) were gone," said Ward. "The animals are all out and safe." Five chickens fenced in the backyard were also unhurt, according to a Banks Fire District statement. The garage of the house was destroyed by the fire, Ward said. "The house itself is damaged, heavily smoke-damaged and fire," said Ward. "We haven't assessed the entire thing, but I'm guessing it's going to be a total loss as well." The fire, Ward said, was "still active" as of 7 p.m. He added, "They've pretty much got it suppressed, but we've got crews inside mopping things (up)." One firefighter at the scene from the Hillsboro Fire Department was hospitalized with what was described as "heat-related stress," according to a statement released by the Banks Fire District shortly before 10 p.m.
"The cause was just the exertion the (firefighters) endure under the stressful situations," Ward explained of the firefighter's ailment. "Compounding that is the heavy gear they wear, the physical work involved, and then of course the hot temperatures compound the situation. They do of course train for this, but every now and then, we overextend ourselves and we get overheated and exhausted." The name and condition of the firefighter were not available Sunday night. Along with Banks and Hillsboro fire agencies, also responding to the fire were the Cornelius Fire Department, Tualatin Valley Fire & Rescue, Forest Grove Fire & Rescue, and the Gaston Rural Fire District. The American Red Cross Cascades Region also responded to assist the residents at the scene. In a statement, the group said it "provided resources to help address the immediate basic needs of those affected such as temporary housing, food, clothing, comfort kits with toiletry items, information about recovery services, and health and mental health services." Traffic was routed around the area during the fire response, as Fisher Road was blocked. 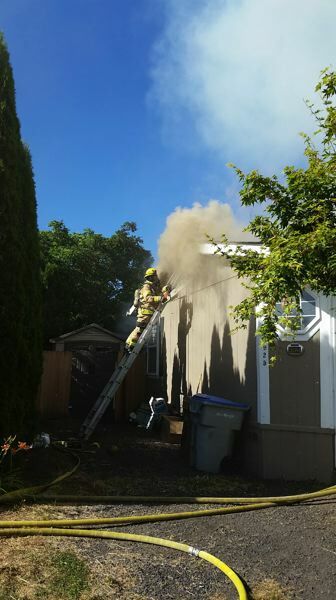 Editor's note: This story has been updated with more information as of 10:10 p.m. Sunday, June 24, including on the hospitalized Hillsboro firefighter and the Red Cross response.